Students and instructors will bow to the flags each time they enter or leave the training area. This shows respect to the school, the instructors, and fellow students. If the students are late for class, they should ask permission to enter class, then, take a place at the back of the class, regardless of their rank. Students who are late will be properly lined up, by rank, after the warm up session. This prevents disruptions of the class already in session. All students must ask permission to leave the training area for any reason. The instructor must know where all students are at all times. Students are encouraged to participate enthusiastically during class time. However, they are to avoid unnecessary conversation with other students or guests. No student, regardless of rank, may instruct or correct another student without permission or direction from Master Michael, Master Michelle or a supervising instructor (black belt). Discipline yourself to show respect to your fellow students who hold a higher rank than yourself regardless of their age. Show respect to all adults, regardless of rank. Wear a clean, fresh uniform every day. Bathe and wash your hair every day to reduce odor and bacteria. When you look and smell clean, you feel better. Female students should wear a white or NSMA T-shirt under their uniform. Students will not wear shoes or socks on the workout mat. Fingernails and toenails should be clean and trimmed to prevent accidental injury. All Belts should be tied to hang evenly, as one side represents the mind and the other side represents the body. Turn away when adjusting your uniform or belt, turn back and stand at attention, facing your instructor to signal that you are ready. Horseplay or disrespect of any kind will not be tolerated. Unnecessary noise, talking or laughing will not be permitted during class. Profanity and foul language will not be permitted on the school premises at any time. Students, parents, and guests will not converse with any person involved in a class session without permission fo the instructor. Grand Master Joe, high-ranking visitors or guests should be greeted with an appropriate greeting and handshake; if the class is in session, the instructor will decide if the class should stop to show respect to the Grand Master or special guest. No food or drink may be consumed on the training mat. No gum chewing allowed! Keep the gear/storage areas clean and neat at all times. Place all personal items (clothes, shoes, drink bottles, etc.) in your personal bag. Please do not eat or drink in the gear room. Personal sparring gear may be stored in the gear room; make sure it is clearly marked with your whole name. Please launder or clean your gear regularly. School owner is not responsible for lost or stolen items. Promise sparring is only allowed in the training areas, under the supervision of an instructor. Students may not engage in free sparring without all protective gear and direct supervision of a black belt instructor. Sparring of any kind is done only in the dojang. Student are never to spar at school, home or in the playground! Gumdo (sword play) of any kind is only allowed under the supervision of an instructor or a designated adult black belt Gumdo student. Never do anything to dishonor yourself, your parents, your school, or your instructor. 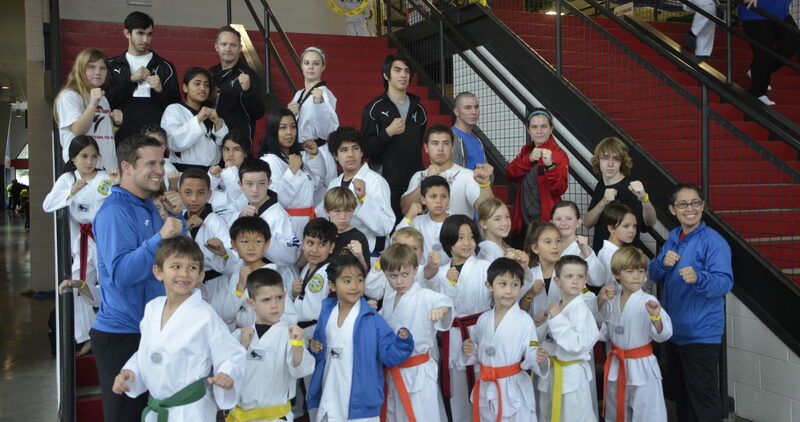 Remember that Taekwondo is not only for your health an self-defense but also for mental health and discipline. This requires constant practice.